Beer. I prefer to drink it cold. Unfortunately, sometimes the beer which I have is warm. This usually happens when we are planning a party, because I buy a bunch of beer on pallets at Costco. I mean, I don't buy it on pallets. It is on pallets at Costco, and I buy one case of 24 bottles. 1) It takes an hour. My recent experiments with the heat transfering properties of water (Hairdryer vs. Bowl of Water) encouraged me to try improving on this beer-cooling method. Instead of cooling the beer with very cold air, I decided to try cooling the bottles with very cold water. I was certain that cold water would work better than the freezer. I prepared three bottles of Heineken. All three bottles started in a 12-pack in the garage, where I assume they settled to the same temperature. I opened the first bottle and took the temperature of the beer inside. It was 82°F (28°C). Warm. This was my starting temperature. I prepared a cold bath. For the "ice bath" beer, I used three cups of tap water (24 oz) and ten ice cubes. I cleared out a little spot in the freezer and was ready for the test to begin. With superhuman agility, I dropped one bottle into the ice water and stood one up in our freezer. Cooling beer takes FOREVER. Luckily I had some rum and Coke handy to pass the time. Even with 10 cubes, the ice bath wasn't very impressive. The beers were still sealed shut, but I could check the temperature of the ice water bath. The temperature was falling. As the ice melted, it quickly cooled the water from room temperature, 75°F, down to 60°F. Condensation began to form on the outside of the ice bath. In 15 minutes, as the last ice cube disappeared, the water approached 52°F. After 20 minutes, it was time to check the results. I opened the beers and tested the temperature of their contents. The ice bath beer was colder. It wasn't even close. Why hadn't I been cooling beer like this before now? The freezer is for fools! The bottles were open now, but I decided to continue the experiment for another 20 minutes. The freezer beer went back into his freezer and the ice-water bath got another ten ice cubes. I mixed myself a singapore sling... and waited. Twenty minutes later, the freezer was starting to have a genuine deliciousing effect. The ice water was almost at its limit when it came to cooling power. It was hard to imagine the beer getting any closer to freezing temperature (32°F 0°C) when the ice water itself wasn't there yet. The results of this experiment demonstrates that if you only have 20 minutes to cool down beer, use an ice-water bath instead of the freezer. It is faster. If you have 40 minutes, both setups work with about the same level of effectiveness. After 40 minutes, the freezer will work faster, eventually dropping the temperature of the beer to freezing. I really like the ice-water bath method. Next I wanted to try aluminum cans! I was curious what the difference would be if I was using aluminum cans rather than glass bottles full of beer. Any metal is more conductive than glass, and aluminum is particularly conductive. Here's a short list of the thermal conductivity of some materials. Thermal conductivity is measured in watts per meter kelvin. Thermal resistance is highly dependant on the thickness of the insulating material, so the paper-thin aluminum will be much easier for the coldness to pass through than a quarter-inch of glass. 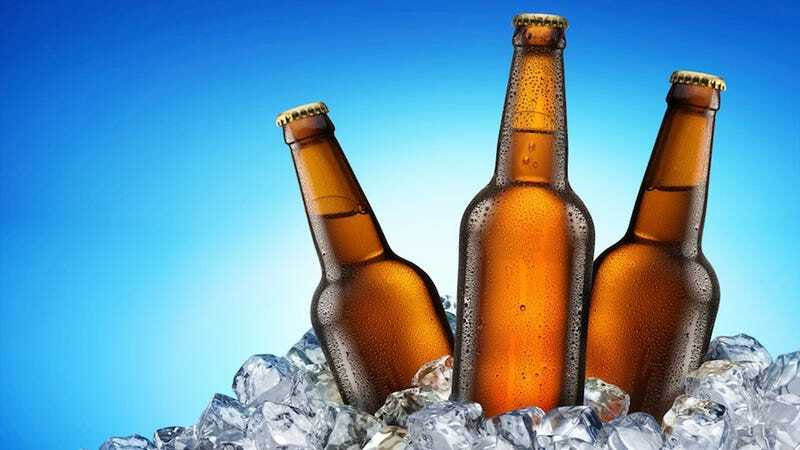 Glass bottles are great for drinking, and the glass is a good insulator for when you are trying to keep the beer cold, but when you are trying to cool down the beer, that insulation works against your efforts to pull all the heat out. I started with a six pack of tall cans of warm Coors Light from a gas station. The start temperature for these cans was 78.8°F (26°C). I don't think I've ever wanted beer less than when I was handling these warm cans of Coors Light. ...and one can in a jar with 3 cups of water and 10 ice cubes. The race. was. on. again. Knowing that the canned beer would change temperature much faster, I only waited 10 minutes to open the cans and test the temps. The temperature difference was even more impressive with beer cans. Check out these results on the chart below. The beer in ice water had dropped dramatically in temperature, from 79°F (26°C) to 50°F (10°C)! Awesome. The beer in the freezer had lost 15 degrees. It was losing heat faster than the freezer bottle had, but the ice-water bath was having an even more extreme effect on the metal can than it had on the glass bottle. In ten minutes, the cans of beer in ice-water had gone from warm to cold, from bad to good. I put them back for another 10 minutes of cooling. A second ten minutes really proved the case for an ice water bath. The freezer beer was down to 54°F, but the ice bath beer was down to 43°F! My cans of Coors Light featured this two-stage temperature indicator. The can on the left came out of the freezer. The can on the right came out of the ice-water bath. The indicator on the left isn't even showing the can as "cold", where the can from the ice water is registering as "super cold"! In the photo above, check out the difference in condensation on the cans! With two experiments complete, and four beers sacraficed in the pursuit of knowledge, I can wholeheartedly declare that a bath of ice water is the fastest way to cool beer down to a pleasant drinking temperature. The freezer is colder, but surrounding a can of beer with cold air is never going to cool it off as fast as dunking it into a vat of cold water. Unless, of course you are making beer slushies.